The “foundation allowance” is sometimes referred to as a “foundation grant.” The calculation of the foundation allowance is the same for both general education and special education students, but the discussion below focuses on general education students because the general education calculation helps determine a portion of the money made available for special education students (see “Operating Monies for Special Education”). As will be discussed below (see “Non-Hold-Harmless Districts”), a district’s foundation allowance sometimes differs from the district’s actual per-pupil operating revenues. In some cases, a district’s per-pupil operating revenues differ from its foundation allowance. Nevertheless, a district’s state foundation allowance is a key financial concept in the funding of that district’s schools. The Legislature’s two ceilings are the “state maximum foundation allowance” for conventional districts and the “state maximum foundation allowance” for charter schools. [lxxxix] The state maximum foundation allowance for conventional school districts in fiscal 2007 is $8,385. $6,500 + $1,885 = $8,385. The maximum foundation allowance for charter schools, on the other hand, is $300 greater than the basic foundation allowance. In fiscal 2007, the basic foundation allowance is $7,085, making the maximum foundation allowance for charter schools $7,385. These “state maximums” are not, however, a limit on a district’s per-pupil operating revenues or on a district’s foundation allowance. Rather, these maximum foundation allowances are related to the highest amount that the state agrees to pay per pupil for school operating purposes; the relationship between what the state agrees to pay and the state maximum foundation allowance is explored in more detail below. As a practical matter, “non-hold-harmless districts” (discussed immediately below) never have a foundation allowance above the state maximum foundation allowance. Of all local districts and charter schools in fiscal 2007, 334, or about 43 percent, are assigned more than the basic allowance and less than the maximum allowance. [xc] Only “hold-harmless districts” have foundation allowances above the “maximum” allowance,[xci] although some hold-harmless districts, such as the Watersmeet Township School District and the East Lansing School District, do not have foundation allowances higher than the maximum in fiscal 2007. The state government calculates its contribution to a district’s foundation allowance in one of two ways, depending on whether the district is a hold-harmless district. We discuss both types of districts below. As noted earlier in this primer, a hold-harmless district has — or has had at some time after 1995[xcii] — the ability to levy homestead property taxes for local school operating purposes and to levy more than 18 mills of nonhomestead property taxes for the same. A non-hold-harmless district, in contrast, has neither. But the distinction between the two types of districts lies in their spending levels in 1995: Hold-harmless districts spent more than $6,500 in state and local revenues on operating expenses that year, while non-hold-harmless districts spent $6,500 or less. The hold-harmless districts’ additional taxing powers were intended under Proposal A to permit those districts to maintain their relatively high spending; without these powers, the higher spending districts would have had to lower their education spending. If a district is a non-hold-harmless district (as most districts are), a portion of the district’s foundation allowance is received from the school aid fund, while the remainder is raised from a district’s nonhomestead property tax,[xciii] which is retained locally. The state’s portion is the difference between the district’s foundation allowance and the maximum amount the district could legally raise per pupil from a nonhomestead property tax. In the computation of the state’s portion of the foundation allowance for non-hold-harmless school districts, the state assumes that all of the district’s nonhomestead property tax is allocated to general education students, not to special education students. Thus, the state effectively assumes for accounting purposes that funding for special education students comes from other sources (as, in fact, it does, since special education is paid from other state and federal revenues). This distinction, however, is maintained only for the purposes of the state’s calculations; in reality, a school district is free to use its local property tax revenue and its state revenue for general education pupils in the exercise of any of its legal powers, including special education or even capital expenditures. Under Proposal A, the maximum amount the district can raise on nonhomestead property is the lesser of 18 mills and the district’s 1993 property tax millage for school operating purposes. Because a district might not actually be levying its statutory maximum millage — due to Headlee rollbacks, for instance — the district might not actually receive the total local property tax revenues that the state assumes in calculating the state’s contribution to the foundation allowance. Thus, a district might not receive combined state and local operating funding per general education FTE pupil equal to the foundation allowance that state law describes. The district’s nonhomestead taxable value in particular should be taken from the state aid financial status report, because the taxable value recorded there has been adjusted to account for any “tax increment finance district”[xcviii] that might lie within the school district’s boundaries. This adjustment for a TIF district is necessary in calculating foundation allowance shares, and the reader should exercise care, since the Michigan Department of Education also posts on the Web unadjusted nonhomestead property tax values. Use of these unadjusted values will lead to inaccurate calculations for some school districts. The general procedure, then, for calculating the state’s share of a non-hold-harmless district’s foundation allowance would be described mathematically as shown in Graphic 12. Consider the Sault Ste. Marie Area Schools, which is a non-hold-harmless district. In Graphic 14, we have calculated the state’s contribution to the foundation allowance for three districts, including Sault Ste. Marie, with which the reader is already familiar. [ciii] Note that these districts’ foundation allowances fall between the basic and maximum amounts. With hold-harmless districts, the usual relationship between a district’s foundation allowance and the state maximum foundation allowance is often reversed: The districts’ foundation allowance is usually larger than the state maximum foundation allowance. The hold-harmless district Whitefish Schools, for instance, has a foundation allowance of $11,157 in fiscal 2007, a year in which the state maximum foundation allowance is $8,385. The existence of such above-average revenues is a key reason for the existence of the state maximum portion,[cvii] which caps the state’s contribution to any given district’s foundation allowance. The state does not prevent hold-harmless districts from generating relatively high per-pupil operating revenues, but the state does cap the amount the state school aid fund will contribute to those revenues. Even if a hold-harmless district can no longer levy hold-harmless millages, it can still achieve per-pupil operating revenues in excess of the district’s foundation allowance, just as a non-hold-harmless district can (see the discussion under “Non-Hold-Harmless Districts,” Page 57). 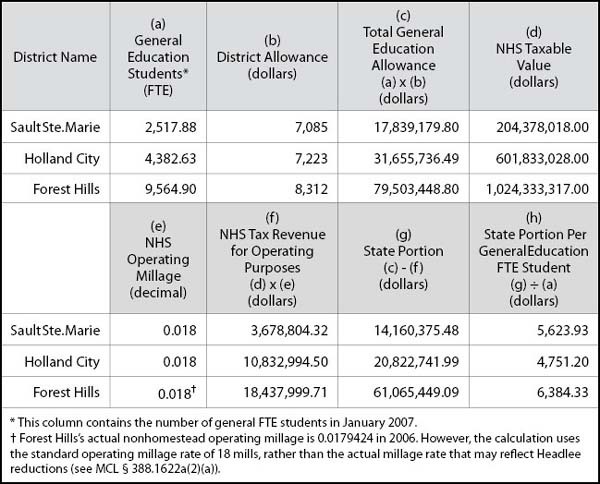 Whenever a district’s local property tax base is valuable enough, the district’s millage on nonhomestead property can provide per-general-pupil operating revenues that exceed the district’s foundation allowance. Like non-hold-harmless districts, hold-harmless districts that levy only the nonhomestead property tax might collect per-general-pupil operating revenues that are less than the district’s foundation grant. This situation arises whenever the district is not levying its statutory maximum millage on nonhomestead property. In this case, the district is not actually receiving the total local property tax revenues that the state assumes in calculating the state’s contribution to the foundation allowance (note that the equation in Graphic 15 is based on the maximum possible district nonhomestead tax revenue — not the actual revenue). Thus, a district may not receive total operating funding per general pupil from state and local sources equal to the district’s foundation allowance. State Maximum Portion = $6,962 + District Foundation Allowance Increase Since 1999. As will be discussed on the next page (see "Annual Adjustments to the Foundation Allowance”), districts’ foundation allowances currently increase by the same amount each year. This was not always so, however, and different districts have received different overall increases in their district foundation allowance. Thus, school districts can have different state maximum portions. In Graphic 16, we show how to calculate the January 2007 state contribution to the foundation allowance for the Lamphere Public Schools, which is a hold-harmless district. [lxxxiii] State government essentially treats each individual charter school as a local school district when distributing state education money. 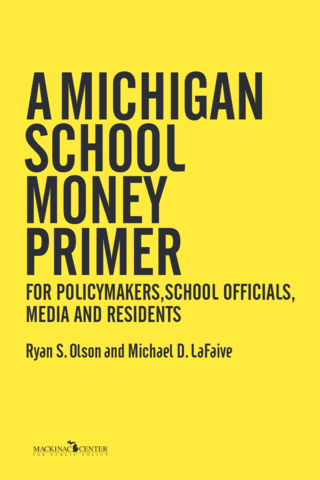 For a brief history of the per-pupil foundation grant from 1994-2000, see C. Philip Kearney and Michael F. Addonizio, A Primer on Michigan School Finance, 4th ed. (Wayne State University Press, 2002), 19‑31. [lxxxiv] A district’s foundation grant is related to the district’s spending prior to Proposal A. Since this spending varied from district to district, the foundation grants also tend to differ from district to district. The provisions of Proposal A have required that this variation be reduced somewhat. [lxxxv] As discussed under “Non-Hold-Harmless Districts,” the state’s contribution to a district’s foundation allowance may be zero in some cases. [lxxxvi] Proposal A established a minimum foundation allowance and a basic foundation allowance; in fiscal 2000, the minimum and basic foundation allowances were equalized at $5,700: see “School Aid Act Compiled and Appendices,” C-1. [lxxxvii] MCL § 388.1620(1); the subsection contains two numbers, the previous fiscal year’s foundation allowance and the current fiscal year’s foundation allowance. One of these numbers is revised as section 20 of the State School Aid Act is amended each year with the school aid appropriations bill. [lxxxviii] Authors’ calculations based on data from the Michigan Department of Education. [lxxxix] Charter schools’ grant levels will be discussed further below, beginning on Page 78. [xc] Authors’ calculations based on data from the Michigan Department of Education. [xciv] The words “significantly” and “in nearly all cases” are necessary qualifiers in this paragraph. If a district’s theoretical maximum millage would yield little more than the state foundation grant, the district could end up with per-pupil operating funding that is actually less than the state foundation allowance. This result would occur when the district actually collects less than the maximum millage (remember that this maximum millage is a theoretical number; a district may or may not actually levy it). The district would then have a theoretical maximum nonhomestead property tax revenue sufficient to drive the state’s contribution to the district’s foundation allowance to zero, even as the district’s actual nonhomestead property tax collection wasn’t quite high enough to match the state foundation allowance without a state contribution. Theoretically, a district could also have actual nonhomestead property tax revenue that yielded per-general-pupil operating revenues exactly equal to the state foundation allowance, rather than greater than the allowance. This outcome, while mathematically possible, is highly unlikely. [xcv] Recall that the “maximum foundation allowance” is not a ceiling on a district’s per-general-pupil operating revenues; it is a cap on the state government’s contribution to the foundation allowance. Also note that the foundation allowance of the district in this example is still less than the maximum. Only the district’s actual per-general-pupil operating revenues exceed the maximum. [xcvi] One example of such a non-hold-harmless district in fiscal 2007 was Pentwater Public School District. [xcvii] For a detailed discussion of these reports, see “State Aid Financial Status Reports” below. [xcviii] A tax increment finance district is a local authority authorized under state law to capture some increases in local property tax revenues from taxes levied by other local government authorities in the area, including school districts. The additional tax revenues captured by the TIF district are to be used to address declining property values. For more information on TIF districts, see “Survey of Economic Development Programs in Michigan,” (Citizens Research Council of Michigan, 2001), www.crcmich.org/PUBLICAT/2000s/2001/rpt334.pdf (accessed April 18, 2007). 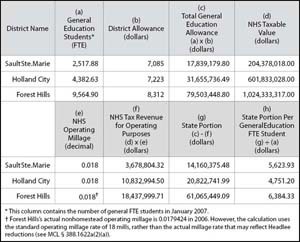 [c] As noted earlier, a district’s general education FTEs and nonhomestead taxable value are both adjusted monthly. The figures used here come from the Sault Ste. Marie Area Schools’ “State of Michigan 2006-2007 State Aid Financial Status Report: Payment Dated 01/19/2007,” 215. Also as noted in the main text, a district’s state aid financial status report is the correct source of the district’s nonhomestead taxable value in these calculations, since the report’s taxable value is adjusted to account for any tax increment finance district that might lie within the school district’s boundaries. The Sault Ste. Marie Area Schools does include a TIF district. [ci] The 18 mill figure is the maximum amount the district can levy, but the district did not actually levy 18 mills in January 2007. The district’s actual nonhomestead property tax was 17.9604 mills. [cii] Because the district’s state aid membership and nonhomestead property taxable value can fluctuate from month to month, the district’s current per-pupil revenue from the state could be different from that calculated here. [ciii] For a graphic description of this formula, see “School Aid Act Compiled and Appendices,” C-3. [civ] Numbers in columns (c), (f) and (g) may differ slightly from state numbers due to rounding. [cv] There are no charter schools above the maximum foundation allowance for conventional school districts, since the maximum foundation allowance for charter schools is less than that for conventional school districts. See “Charter Schools,” next page. [cvi] As with the non-hold-harmless districts, this base should be taken from the district’s state aid financial status report. See the discussion below. [cvii] The state maximum portion is, in turn, less than the state maximum foundation allowance. Thus, the state’s contribution to a hold-harmless district’s foundation allowance is less than the state maximum foundation allowance. [cviii] These property tax levies are referred to as a “hold-harmless millage” because only hold-harmless districts are ever eligible to impose them. See “ ‘Hold-Harmless’ Millage” above. [cix] The nonhomestead taxable value presented in the state aid financial status reports is adjusted to account for any “tax increment finance district” that might lie within the school district’s boundaries. (See footnote xcvii for a brief discussion of TIF districts.) This adjustment for a TIF district is necessary in calculating foundation allowance shares, and the reader should exercise care, since the Michigan Department of Education also posts on the Web unadjusted nonhomestead property tax values. Use of these unadjusted values will lead to inaccurate calculations of state foundation allowance contributions for some school districts. [cx] Because the district’s state aid membership and nonhomestead property taxable value can fluctuate from month to month, the state’s current contribution to the district’s foundation allowance is likely different from that calculated here.